I hate to confess this little secret, since I am generally a very big supporter of the book industry. However, when you're planning a wedding (and a Welcome Picnic open to all 80 guests) on a $2,000 budget, your number one budget priority is not purchasing wedding planning books. And, yes, we even resorted to returning books for store credit that had been given to us as gifts (after we read them from cover to cover without breaking the spines). A little pathetic, I know. Offbeat Bride by Ariel Meadow Stallings, of course. It's a seminal text in the movement to plan the wedding of your dreams (not anyone else's). Plus, she's coming out with a new edition this spring. Woo-hoo. The DIY Wedding by Kelly Bare. It provided a lot of sensible advice and options about various aspects of wedding planning. One Perfect Day: The Selling of the American Wedding by Rebecca Mead. This book should be required reading on all college campuses. It's that enlightening. It explains the Wedding Industrial Complex from a historical perspective and can help ground anyone who's caught up in the hubbub of wedding planning. So, please spill the beans! Which wedding planning books helped (rather than hindered) your wedding planning process? Woo hoo for my library having two out of these three books! So I just grin and bear it. Haha, my life sounds pretty similar to yours, Sarah. I get the same comments about how our wedding will be "smaller, easier, more low-key" too and people act like it's some fate that was imposed upon me rather than a conscious, deliberate choice. It's been unbelievable helpful in the creation of our non-denominational, non-traditional ceremony because it provides examples of ceremony scripts which will help include my faith without alienating the non-Christian groom as well as a section on writing your own vows. Plus, it's provided a ton of logistical tips for the ceremony which it perfect for me because the only weddings I've attended so far have been super formal and not at all the style we're going for. And although it's not a book, I bought the 2009 issue of Real Simple Weddings and completely adore it. For a bride who wants more information on weddings but doesn't want to be made to feel guilty about what her wedding is lacking, I think it might be one of the only options in wedding magazines, haha. Bridal Bargains, 8th Edition: Secrets to throwing a fantastic wedding on a realistic budget -- got it from the library, had some good tips! I say avoid Wedding on a Budget books written by professional "wedding planners," they'll spend pages and pages trying to make you feel like you can't plan your own wedding and should invest in an expert planner. Also don't waste time with wedding books published prior to 2000, unless you plan on giving long distance calling cards as favors! I got married in Oct. 2009 and read "Anti-Bride Etiquette Guide: The Rules - And How to Bend Them" which was helpful. It let you know what the "traditional" route was and then had good suggestions on how to go about making your wedding your own. For example, suggestions on how to have a guy as a bridesmaid or how to explain to a father who is distant that he isn't walking you down the aisle. Another suggestion, use Paperbackswap.com to get wedding books. You trade books and only paying media mail shipping. That way you have the book as long as you need it for planning, then you just re-post it and another bride can use it. I second the Real Simple Wedding magazine. I loved the way they showed all the different good bouquet flowers by name and showed which season they are in bloom. Perfect if you're planning on using local markets to get your flowers. I actually just started reading "One Perfect Day" and it is incredibly eye-opening. I was planning on avoiding David's Bridal like the plague anyway because I've been accosted by them too many times as a bridesmaid, but after reading a woman in China is paid 40 cents to hand-stich beads on a dress that will end up selling in the U.S. for more than $800, it sealed the deal. Definitely read this book. You will be amazed. More kudos for the Real Simple special edition. I just bought the 2010 edition and it is the only wedding mag that has been the perfect combination of aspirational and realistic. Plus the checklists are very helpful. It's the first and only wedding mag that hasn't given me hives. As a bride to be, I found myself dealing with lots of "big stuff" as most of us do when we're going through a big transition in our lives - feeling anxious and emotional at times, experiencing change in some of my closest relationships, etc. I found "Emotionally Engaged: A Bride's Guide to Surviving the "Happiest" Time of Her Life" online and ordered it - it was a great buy. This isn't to say that getting married isn't a happy time, but sometimes I think we (and those around us) tend to try to push other emotions to the side. This book is really helping me to be fully present and experience some of the harder issues that come up during engagement. Hee hee, that picture is my library! 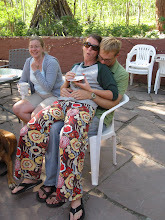 Offbeat bride tribe - ok, it's a website, sorry! :) They actually have a good thread on books there, too. The Green Bride Guide can be a helpful book. It was actually written by a peer of mine at graduate school. I think she might have started a website too...haven't checked that out yet. A book that has been EXTREMELY helpful to me is "The Conscious Bride" by Sheryl Paul. The book discusses the emotional aspect of the engagement and planning. There's also a "Conscious Bride Wedding Planner". The planner leads you through several exercises to help you determine your values, priorities and vision of your wedding day. My fiance and I really enjoyed walking through these exercises and they've been a HUGE help in our decision making. Highly recommend both books! I looked at a few traditional books. But the biggest resource for me was the internet. And I love Offbeat Bride's website and the Offbeat Bride Tribe was a life saver. I encourage checking it out. 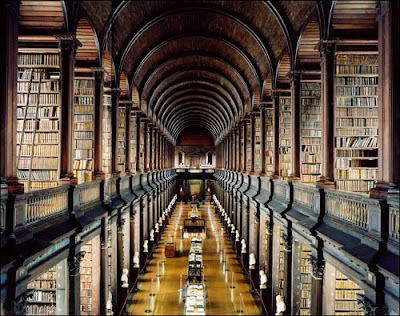 I am in love with the library in the picture, where is it??? What a timely thread, as I was at the bookstore yesterday browsing the wedding books and feeling a bit lost amongst the selection. Good to know some that I should focus in on, and I will be sure to check their availability from the library. Did anyone find the massive wedding planning binders helpful? The ones with line-item budget worksheets that went on for pages and pages? Or are there other resources that you found helpful in terms of planning the logistics of the wedding? White Weddings by Chrys Ingraham changed my idea of weddings, marriage, our culture...maybe my life! It's a fantastic read and an eloquent and informed criticism on the wedding industrial complex, our obsession with it and what it's all really about. I recommend it to everyone, but especially engaged couples. I really don't read books about weddings. I get inspirations from wedding planners and in the internet. I totally agree - buying wedding planning books is a waste of money -- especially when you have access to the internet which is like one big library! Thank you for sharing these wonderful books although I'm too far to get married but as soon as that time comes I'm already prepared. I read almost every book in my library.... but I've had almost three years to do it. I am also guilty of reading books at the book store. I actually enjoy looking through the crazy blowout wedding books by the likes of Preston Bailey and Colin Cowie. Because I know that I won't have anything remotely like that, I can just relax and enjoy the pretty pictures. 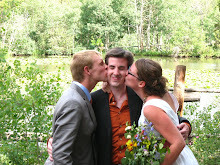 Otherwise, I've mostly relied on the internet (A Practical Wedding in particular) and friends. I actually disagree that One Perfect Day is a good book to read while planning a wedding. I found Rebecca Mead's attitude very negative. She points out problem after problem, but never any solutions. It made me feel paralyzed and guilty for wanting a wedding at all. Perhaps she wants us to emulate her own reception - hosting 80 people at her Fort Greene townhouse. I live near Fort Greene- homes like that run well into the millions. If that's her "practical" solution, she might want to start researching a book about Brooklyn real estate. 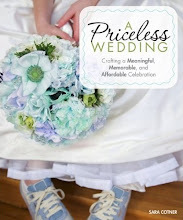 I've been working with The Bride's Book of Lists by Amy Nebens, and have really enjoyed it. Broken into different tabs (Music/Flowers, Photography, Hotel/Transportation, etc . . .) with each tab offering a list of general ideas to consider, and questions to ask potential vendors. No pictures anywhere in the book--just a bare bones 'things to think about' kind of guide to wedding planning. I can't recommend "The Conscious Bride" highly enough. I think it's what got me through the planning process without hating my mother. ;) Basically its thesis is that the wedding planning process is a rite of passage for women, and like all rites of passage it should involve mourning as well as celebration for the bride, and her friends and family. The things I didn't like were that it was occasionally slightly sexist (assuming that a wedding is a rite of passage for ALL women and NO men) and occasionally foofy, if you're the kind of person who rolls her eyes at guided visualization exercises. But basically it served as a reminder for me that if I was fighting with both my fiance and my mom about what kind of plates to have, there was probably more going on than just the plates. It helped me keep my priorities on my relationships with the people I love. For those planning a Jewish or semi-Jewish wedding, I also recommend "The New Jewish Wedding" by Anita Diamant. Fantastic all-denominational resource. The early 19th century wedding was a private one held at home with family and maybe a few friends. When weddings began to move into churches, larger numbers of people were invited and the "professionalism" of today's weddings were born because all of a sudden the wedding became too complicated for the family to handle on their own. Enter wedding attendents, florists, bakers, etc . . . The author traces the rise of today's elaborate wedding and it's facinating how most "traditions" are really rather new. But if you really want a family-only wedding with maybe a few close friends, there is plenty of historical precedent. I just started One Perfect Day after your suggestion and so far I love it! My fiancé thinks some of her commentary is a little judgmental, but I don't mind it so much. I'm really enjoying the historical ties to current "traditions". I've flipped through The Green Bride Guide a few times since our engagement and I don't find it that useful. I feel like I already have "green" common sense and no book is going to tell me anything new I haven't thought of. 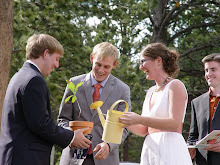 However, I do think DIY Wedding is more helpful for actual new ideas for wedding projects.